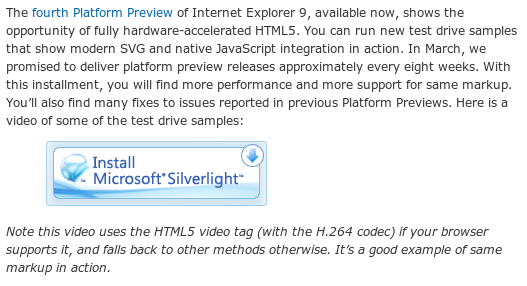 No, suggesting I install Silverlight is not within the spirit of HTML 5, standards and correct fallback. Certainly not without first providing Ogg or WebM versions of the video. Do they really think that it will be some sort of earth-shattering precedent-setting or some sueable event if they were to provide Ogg or WebM versions? Come on, guys, flex a little bit. Gerv, you’re calling on Microsoft to flex and support Ogg/WebM when at the same time, Mozilla isn’t flexing at all to support H.264. Flexibility works both ways. In addition, take a look from Microsoft’s point of view. Being a company that is no doubt sued many times each year, anything to lessen this impact is welcome. The MPEG-LA is a safeguard for Microsoft and the other licensees as in if anybody ever decides to sue any member for infringing patents on A/V codecs, the LA will counter-sue with its portfolio of patents. Safety in numbers is its purpose. It’s not ideal, but in the litigation-driven USA, it’s probably the safest option. Ogg doesn’t come with this guarantee, and so is an incalculable risk. It’s not enough to say that nobody has taken out a patent on it, since it may be infringing other submarine patents held by troll corporations. Nobody’s going to sue Mozilla for including support since it’s a charitable body and that wouldn’t look good, but Microsoft is always fair game. This same reason is most probably why Apple has taken the same line. I don’t know the exact situation with WebM but assume it is similar. Finally, Microsoft has said that if Ogg/WebM codecs are already installed and available, then IE has no problems using them. You are comparing apples and oranges. I am not calling on Microsoft (in this post) to support Ogg or WebM in Internet Explorer, I am calling on them to use the freely available encoders to post an Ogg or WebM video on the Internet. So the analogous situation would be Mozilla supplying H.264 versions of videos it posts on the Internet in <video> tags. But the difference is that while the Ogg and WebM encoders are freely available (both as in freedom and as in price and as in licensing and patents), that’s not true of the H.264 encoders. If it were, we wouldn’t be in this format war. Expecting Firefox to support H264 is like expecting a girl to pee upright. Expecting Microsoft to support open standards, on the other hand, is like expecting a spoiled brat to set the dinner table. If they were falling back to flash would you be happier? Asking a blog to fall back to two codecs that are not widely use is a long shot. Maybe in 1 to 2 years if WebM catches on, but then again it’s alienating mobile phones which across the board mostly accept H.264. Sorry, but if posting a video requires encoding it into 4 different codecs to satisfy everyone, it will never happen. Why not be happy they are actually improving IE9 by leaps and bounds, and making sure it does work with Ogg/WebM if you have the codecs? As far as I know, the only non-beta browser to support WebM is Opera, so I think it’s reasonable on Microsoft’s part not to bend over backwards to support that. Ogg has a little more presence (Opera, Firefox, Chrome), but the WebM project has basically rendered that stillborn, so I wouldn’t feel much motivation to use that format myself. 1. Display very same MP4 file using Flash. 2. Simply embed that same file and allow whatever plugin the user has to display it (Quicktime, Windows Media Player, Totem, whatever). 3. Give me the link to the file so I can save it or open it with one of a myriad of players. They didn’t do any of those. They didn’t even provide a link! Instead, their “fallback” was to tell me to install Silverlight, which is arguably even worse than the Flash situation we’re trying to break free of. You cannot push for standards with one hand while pushing for your own proprietary nonsense with the other. Forcing me to View Source in order to find the file is just plain arrogant and hypocritical. Frankly, Ogg Theora for video is still significantly too obscure to be a viable fallback (unless you’re going to provide a fallback for the fallback). Most people don’t have anything that will play it. Ergo, it’s not a good fallback. On the other hand, Silverlight is even *more* obscure, so that’s an even worse choice. Plain old MPEG would be a good fallback for video, or a case could be made for Flash.